Somebody tell Keith Richards that this is no laughing matter, because after teasing a final curtain call at Ozzfest in Japan last November, heavy metal pioneers Black Sabbath have officially announced an initial run of dates for what it claims to be its last tour. 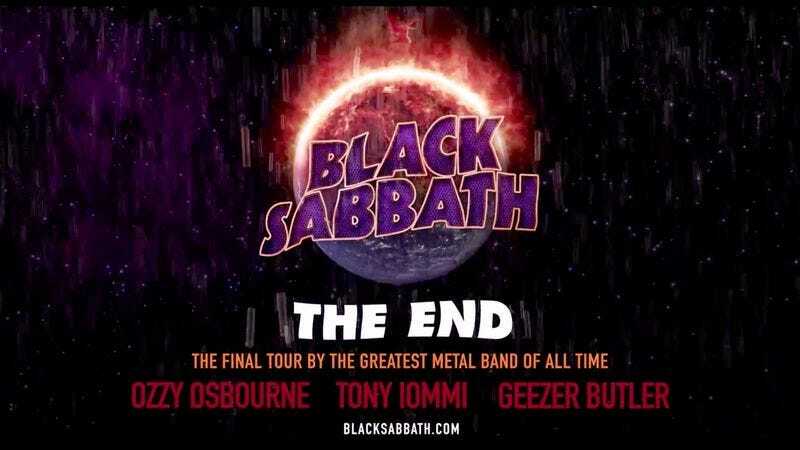 Dubbed “The End,” the tour kicks off on January 20 in Omaha, Nebraska and winds its way through Canada and the U.S. until a final date at Madison Square Garden on February 25. After that the band will hit Australia and New Zealand, and from there, who knows? It seems like every year there are a handful of legacy acts launching what they proclaim to be their final string of live performances–Mötley Crüe has been working through its “last” tour for two summers now–but this might actually be one that sticks. Given guitarist Tony Iommi’s ongoing battle with cancer, this goodbye jaunt carries with it an aura of finality, and might actually be fans’ last chance to see the ’70s rock powerhouse live and in concert.